The luggage tag is made of rubber in a turquoise color. 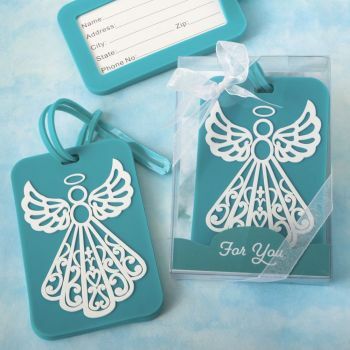 It is decorated with a detailed white Angel design in a modern graphic style. A blank luggage tag is included and allows important information to be recorded such as name, address, city, state, zip and telephone number. There is a sturdy rubber hanger strap to attach to your luggage. This lovely functional favor is guaranteed to be used!